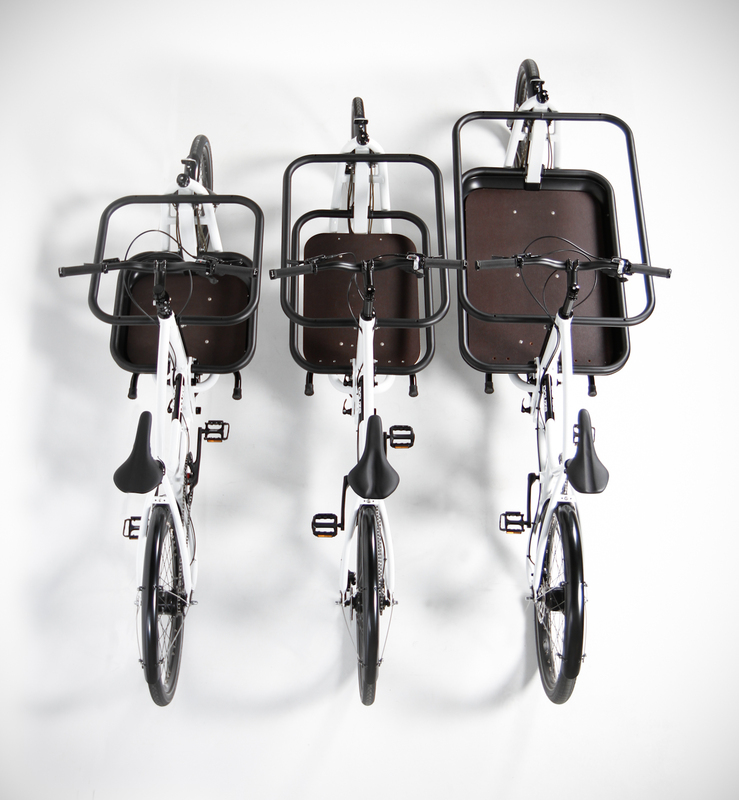 This week we received 4 new specimens of what we see as a landmark product: Douze cargo bikes. They're from France (say DOOZE!). Dean's been riding our first Douze as his own near daily since Winter. He's in love. 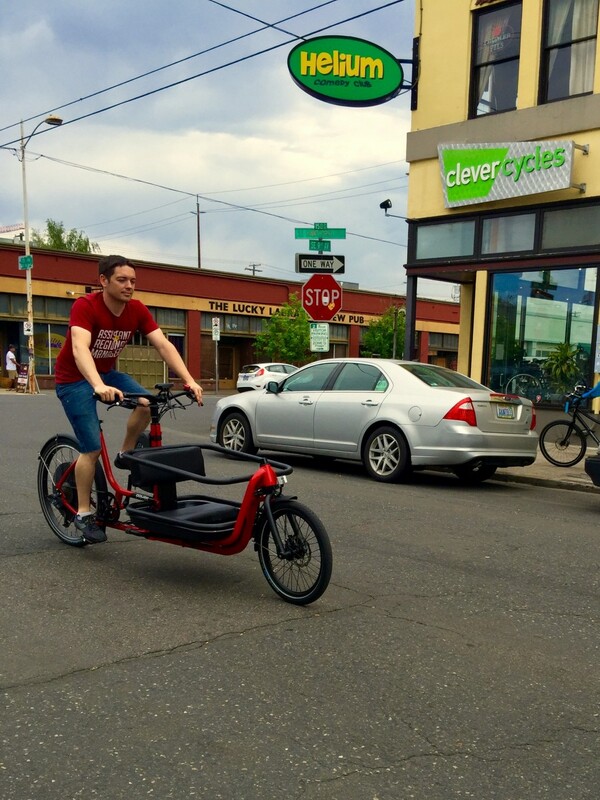 Ever since we brought the Bakfiets.nl Cargobike to Portland in 2007, our best and biggest car-replacement family bike offerings have fallen in the category one reviewer called "land yachts." Upright. Plush. Plain-clothes friendly. Overbuilt, like rolling playground structures, often heavy. We still love these kinds of bikes, in part for how they challenge local sensibilities of what makes a bike good. It's not always about low weight and zip and sporty handling, especially when your family is aboard. But sometimes those things are important. Say you live in a hilly area, or are accustomed already to top-end sport bikes. 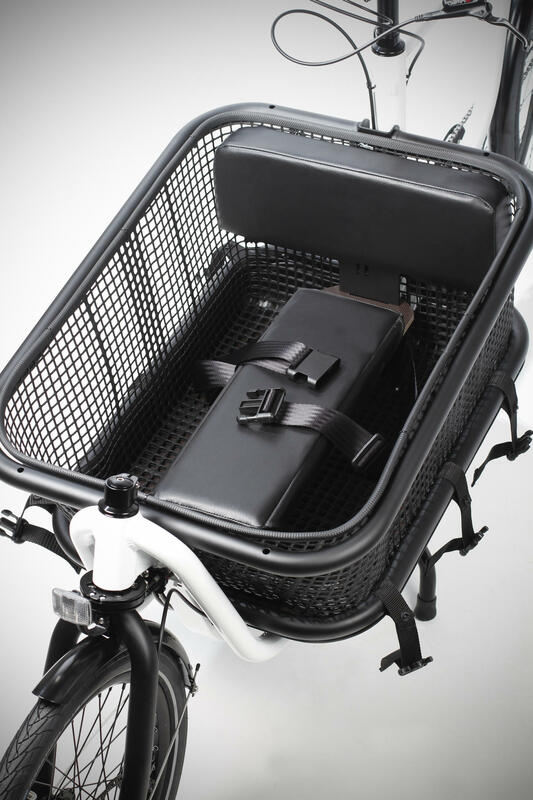 Douze cargo bikes look, feel, and ride like modern high-performance recreational bikes, not Dutch utility bikes. Their novel quad-cable steering mechanism provides remarkably stable, consistent, precise handling at both low and high speeds: long an elusive goal for designers of bikes in this format. 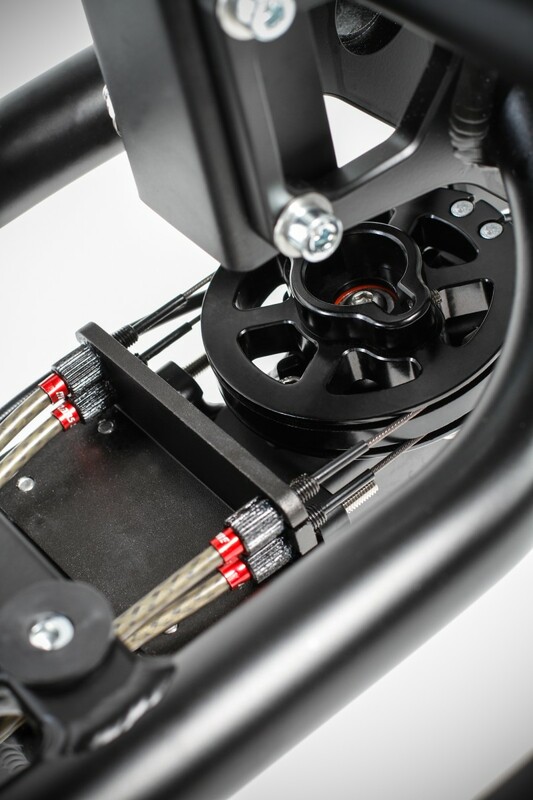 The cable steering also provides a much tighter turning radius than any other bike in its class, exceptionally easy to manage even walking alongside in tight spaces. 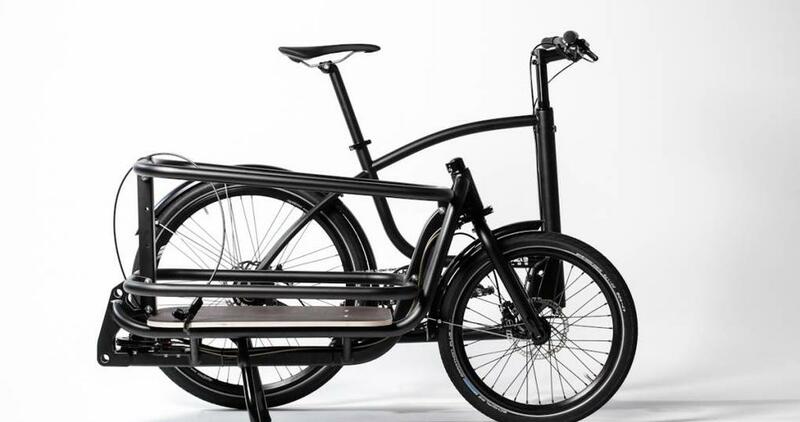 Douze bikes split into 2 parts, front and rear, very easily in under 5 minutes. This makes transporting them in other vehicles not so challenging. It also means they ship more economically. But most of all, it means that we can mix and match front and rear ends freely to assemble just the bike you want. Prefer a step-through to a step-over frame? Both are available. 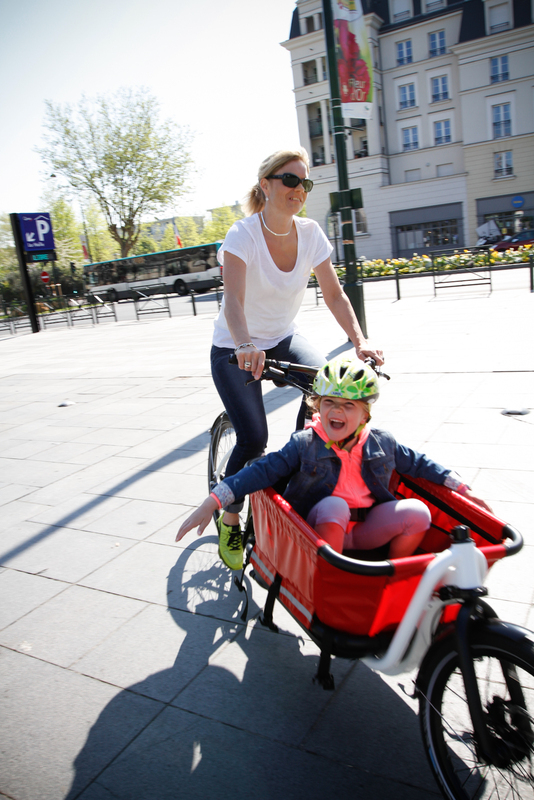 There are long, standard, and short front ends, with a growing assortment of child seating and cargo carriage options for all. Electric assist? As you wish. Chain or belt drive? Either. Derailleur or internal hub gearing: uh-huh. Hydraulic disk brakes. Dynamo lighting. All these things are standard options available at modest prices, not special projects to be worked out over months in a flurry of quotations for custom work, or orphaning original parts. Test rides are convincing, more than thousands of words. Ride on over with the kids or your sweetie or your dog or all three. Prices for fully-equipped Douzes start around $4,000, with premium electric assist models starting around $6,000.